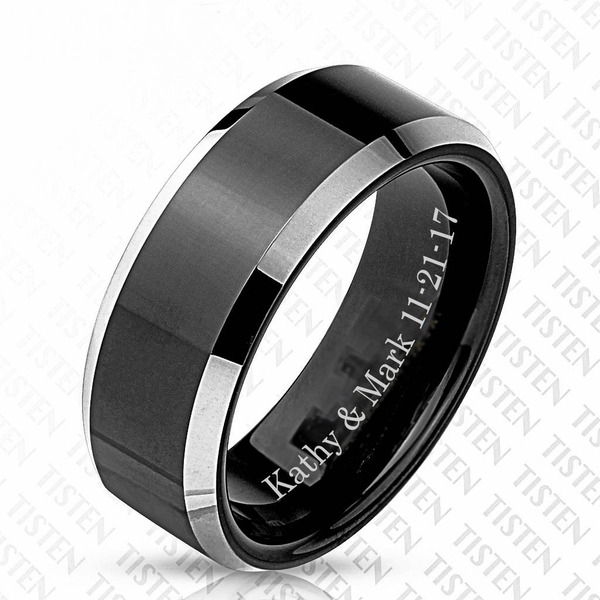 This engraved tungsten & titanium ring is a sentiment of love that can be inscribed with names, dates or a custom message. Our promise rings and wedding bands can be personalized with up to 25 characters per ring. **Upon purchase you need to message us (either during checkout or after) with the sizes you need and the engraving instructions **Whatever size you see listed is what we have. No half sizes, only whole. Personalized Promise Rings, express your love engrave your names and date in a couples ring. Each ring can be engraved on the inside or the outside of the ring. Please specify the part you would like to engrave it. As impressive as they both are, now you can have the best of both worlds in one single product! A scratch-resistant, hypo-allergenic piece of jewelry whose endurance is matched only by the classy, stylish designs they are made in. The patented ratio of tungsten and titanium creates a symbiosis that brings out the best in each other. You don't have to wait, the next generation of rings are here!